Hectic mornings are easier with the 16 oz. 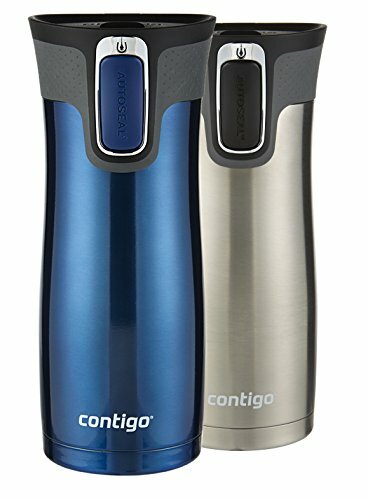 West Loop Stainless Travel Mug with Easy-Clean Lid, because this mug features a one-touch AUTOSEAL lid that automatically seals between sips to prevent spills. This double-wall vacuum-insulated mug is engineered to keep drinks hot for up to 4 hours or cold for up to 12 hours, without a sweat. We mean that literally, because this vacuum-insulated mug keeps your drink at the optimal sipping temperature and eliminates condensation for dry hands. The AUTOSEAL lid creates an easy one-hand drinking experience and it fits most standard car cup holders, which makes it ideal for the commute! We passionately urge parents, teachers, commuters or anyone on-the-go that loves a hot drink, to grab this mug!.